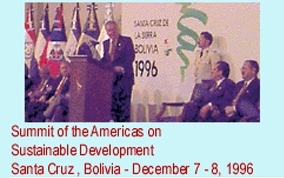 An important initiative from the Miami Summit was the inclusion of a proposal from the President of Bolivia, Gonzálo Sánchez de Lozada, to call a specialized Summit on Sustainable Development, held in Santa Cruz de la Sierra, Bolivia in 1996. The objectives of the Special Summit were to establish a common vision for the future according to the concepts of sustainable development. This Summit resulted in 98 mandates focusing on Health and Education; Sustainable Agriculture and Forestry; Sustainable Cities and Communities; Water Resources and Coastal Areas; and Energy and Minerals. The general consensus on the concept of including economic, social and environmental elements within an understanding of sustainable development was perhaps the most important achievement of the Bolivian Summit. Consensus was also reached on other issues such as a financial resources, technology transfers, division of responsibilities, cooperation and Biodiversity among others.